In 2015, began the construction of this tourist center Plaza Las Salinas in the central part of Cayo Las Brujas (small island next to Cayo Santa Maria), it opened its door in March 2018. Plaza Las Salinas is located south of the hotel Playa Vists Mar and Dhawa Cayo Santa Maria near the beautiful beach of Playa La Salina. "Pueblo" means village, but in this case it's more like a shopping and entertainment area where tourists will find many other options besides the ones offered in their all-inclusive resort, and at very reasonable cost too! 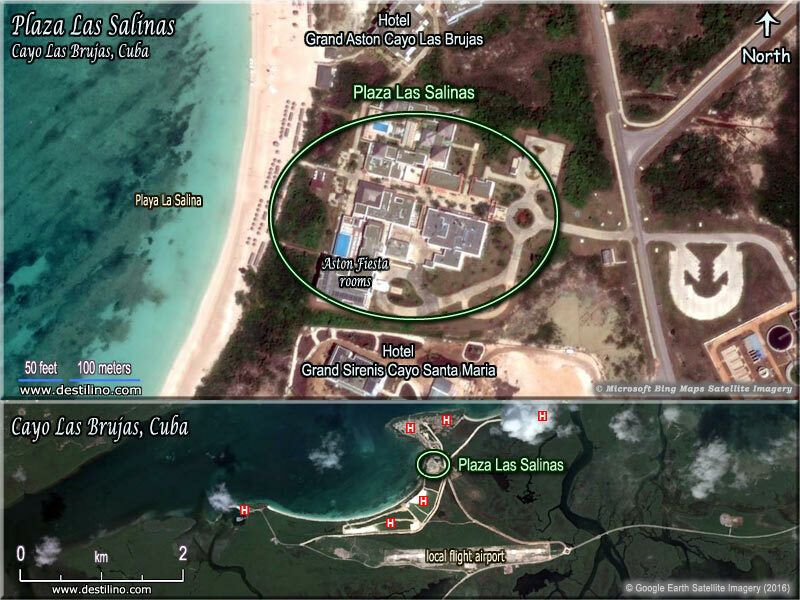 This new commercial center will offer similar services to the ones found in the other existing « pueblos » in Cayo Santa Maria (see links on left). What is different with this Plaza ... There is a boutique hotel Hotel Las Salinas Plaza & Spa of 67 sea view rooms. Note that this hotel doesn't offer the « all-inclusive » package like in the other hotels. "Mar Mediterraneo" Italian restaurant (buffet and patio). "Asahi" Japanese restaurant (sushi bar and four tepanyaki tables). "Bodegon del Centro" Creole (Cuban) restaurant. "Atabey" Disco (can also host events and celebrations). "Flor de Sal" Health center (spa services and a beauty salon). Also ... Shops, artcrafts, rental center, etc. Click to see a detailed map of the services available at the Plaza Las Salinas. Guests staying at the Playa Vista Mar and the Dhawa Cayo Santa Maria can go on foot by the road and paths. Guests staying at Villa Las Brujas can go on foot by the beach (Playa La Salina). Guests from other hotels can go by taxi or with the Panoramic Bus (2 CUC one-way) which stops at every hotel, pueblos (aka plazas), and the Delfinario (dolphinarium). Note: Hotels like Dhawa and Angsana have "Cayo Santa Maria" in their brand name, but they are in fact located on the island of Cayo Las Brujas (a few kilometers west of Cayo Santa Maria). The beach resorts of "Los Cayos de Villa Clara" are often simply reffered as Cayo Santa Maria (its main siland). So keep in mind that you need transportation to get form Cayo Las Brujas to Cayo Santa Maria or vice-versa.